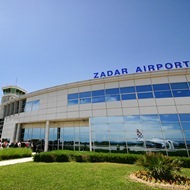 Zadar Airport (Zemunik) is located 13 km from Zadar city centre. Until year 2010 Zemunik airport was one of the rarely airports in the world when a public road has been the taxiway. Due great weather condition and geographical location the airport is used as a former base for Inter Cockpit, Lufthansa's flight school and Croatian Air Force training base.